I decided to annotate the title of this weekly post with the word "ramblings" since it more clearly describes the content I write on Monday mornings. I received my SanDisk 8GB micro SDHC card for my Tilt from Digital Media Outlet for $56 and it includes a USB adapter. It works well with the AT&T Tilt, I just copied the content of my 2GB card to the 8GB card and was on my way...I will be using it heavily this week transferring the contents of my Sony camcorder so I can email selected content to the Kodak Gallery. I may have found an issue with my Dell XPS 720 disk configuration which might be causing the blue screen. When I installed the RAID 1 array, I use for data, I installed the drives in two bays next to each other without looking at the controller setup. There are 2 SATA controllers in the system and my RAID configurations was using both. Theoretically it should not matter and would provide a redundancy on the controller front, but you never know how the nVidia RAID drivers are architected. I decided to try placing both disks on the same controller, the system seems more stable (it has been up for over 2 days). The jury is out and I will have to see how things go this week. Continue work, my review of SBSH Mobile Software Facade application. This is a smartphone (Windows Mobile Standard) today screen replacement. Start a review of Slingplayer Mobile for Windows Mobile. Two weeks, I had issues with my iGo Juice charger not charging my AT&T Tilt and my X60. It was a bad cable between the charger and the devices. The cable is braided and looks heavy duty but probably one of the connectors went bad. I received a new one for $19.99 and everything is working fine. Along with my Lenovo charger going bad, two power supply in three weeks is very bizarre. I use Wikipedia as a source of reference for my blog. Encyclopedia Britannica has noticed that a lot of bloggers are doing that and is offering the service free to web publishers. I heard about it from techcrunch via twitter. I signed up but have not heard back, apparently since they got the publicity they have been swamped. My WebIS Pocket Informant 8 (review) vs Birdsoft's Xtreme Agenda (my review) comparison has been published today on pocketnow.com. I ordered a SanDisk 8GB micro SDHC card for my Tilt from Digital Media Outlet for $56 and it includes a USB adapter. I will use it during my vacation to copy still pictures from my Sony camcorder's Memory Stick to the micro SDHC card using my Delkin USB Bridge. I will then be able upload the pictures to the Kodak Gallery using my Tilt. We will have to see how well this work since I have not yet figured out how to filter the copying. Start my review of SBSH Mobile Software Facade application. This is a smartphone (Windows Mobile Standard) today screen replacement. Last week I had issues with my iGo Juice charger not charging my AT&T Tilt and my Lenovo X60 charger going bad. My Tilt charged fine using the HTC charger. I received a new charger for my X60 in less than 24 hours from IBM (tough to beat this level of service), then my iGo charger started not to power my X60. I think it is the output cord and I have ordered a new one, maybe that was the problem charging my Tilt although I was able to charge my iPhone and my Verizon SMT5800. It is very bizarre that I am having all these power supply problems at once. The iGo has been very dependable over the years (I think it is at least 4 years old) but it may be coming to the end of its life. I have not used twitter very much this week other than watching the incessant although amusing rantings from scobliezer. There seems to be a class of highly read bloggers that pretend not to take themselves seriously, but their continual banter leads me to believe that they do. I am also following WMExperts, they are trying to reach out in all sorts of ways using the latest blogosphere technologies and it very interesting to watch. But what makes twitter easy to follow is Rod Begbie Vista Gadget, without it I doubt I would be plugged in to twitter as much. On my side of twitter I have not reported much, I find I don't have the time or inclination in generating clutter and probably will just use it to report on events I attend or write random thoughts that don't merit a post. Vista SP1 has been rock solid on my X60, however I can't say the same with the XPS 720, I have had two lockups this week with no real reasons. I did get a bluescreen dump on one event which supposedly pointed to a disk problem. I ran the disk check utility and it found no issues. I may run HDDregen to perform a surface scan just to be sure. Continue working on a WebIS Pocket Informant 8 (review) vs Birdsoft's Xtreme Agenda (my review) comparison. I am writing this post as a passenger driving up I95 back to Washington after a long weekend in South Carolina. Verizon Wireless broadband network is getting better and better. There are more areas with EVDO on I95 than last time we took this trip. I did run into a problem with my AT&T Tilt, it won't charge. I am using my iGo charger and had what seems to be a similar problem with my Wing. I had to replace the battery on the Wing and initially use the HTC charger to get it going again . Hopefully this is the same issue. I have been using my iPhone extensively this weekend, I wish I had the 2.0 firmware with Exchange ActiveSync. I had a User Access Control (UAC) issue with Vista SP1 on my Dell XPS 720. It seems that SQL Server Express which I use with Microsoft Office Accounting does not work well with UAC. 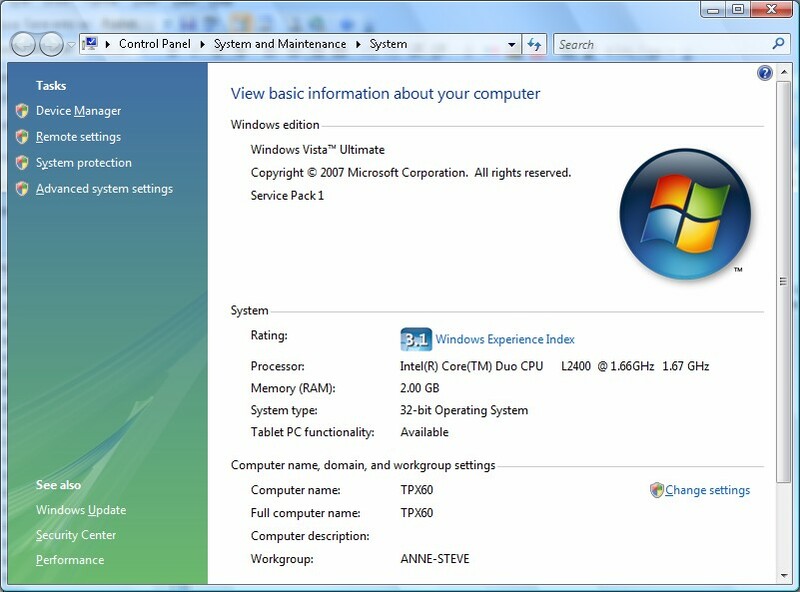 Before SP1 I ran with UAC turned off, but when you install SP1 it turns it back on and I had not noticed it until I ran into Office Accounting not working. There is a work around on the SQL Express MSDN blog but turning off UAC was easier. I may go back and apply the work around later since it is a good idea to have UAC turned on. Micro-blogging is a form of blogging that allows users to write brief text updates (usually less than 200 characters and publish them, either to be viewed by anyone or by a restricted group which can be chosen by the user. These messages can be submitted by a variety of means, including text messaging, instant messaging, email, MP3 or the web. I think it is an interesting concept to report during an event, but on a daily basis I am not sure I see a lot of value yet. It would be nice if it had a way to incorporate multimedia content like pictures or audio. I am subscribing to Robert Scobble twitter stream, he is over the top (when does he relax) and sounds like he is aiming for the title described in a NY Times article yesterday: "In Web World of 24/7 Stress, Writers Blog Till They Drop" (link). My twitter micro-blog is http://twitter/mydigitallife. and you can follow on the right sidebar of my blog. I am leaning towards turning this feature on and off I probably won't use it on a daily basis. 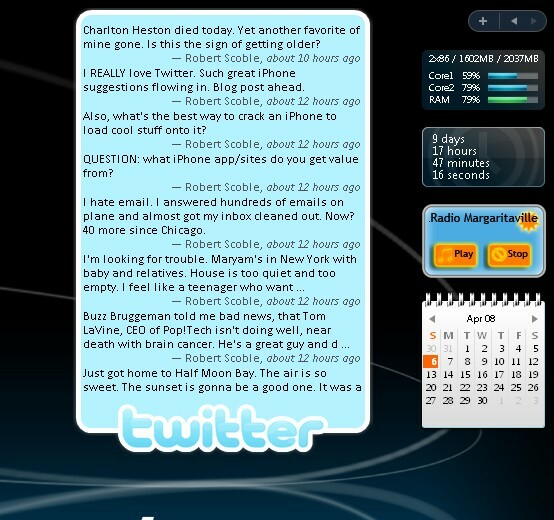 The twitter Vista gadget from Rod Begbie is very nice. Here it is undocked from the side bar. You can also see my 9+ day uptime in the sidebar. The new beta features of TypePad in comments and archives are active on my blog. They provide next and previous markers at the bottom of the page to make navigation easier. My review of trapster has been posted on pocketnow.com. Start working on a WebIS Pocket Informant 8 (review) vs Birdsoft's Xtreme Agenda (my review) comparison. 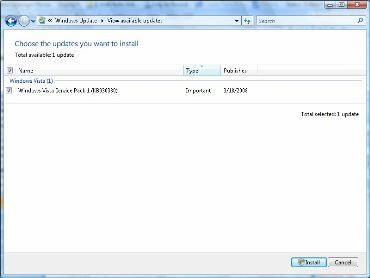 My Lenovo X60 with Vista SP1 has been running smoothly since I installed SP1 on Friday. I have no issues to report. I did have a strange problem crop up on my Dell XPS 720 yesterday; Excel and Word 2007 failed to load (invalid program file). I initiated the Office 2007 repair, but that failed as well and blue screened the system. The dump analysis revealed a hard drive problem. I ran a check disk (ran without finding any issues), however the Office 2007 repair still failed. 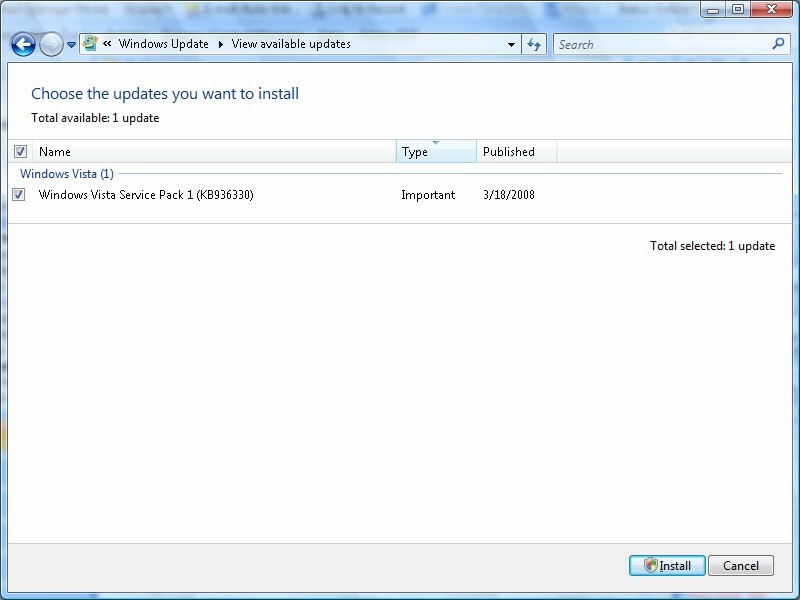 I had to reinstall Office 2007 which prompted me with the fact that an uninstall did not successfully complete, however it looks like the reinstall cleaned everything up. The good thing is that all my settings were saved, especially in Outlook which I customized quite a bit. Bizarre, I may run checkdisk again today to make sure my drive is ok. This week the CTIA 2008 conference is in Las Vegas. This is the love to hate conference. It is sponsored by all the major cellular carriers (CTIA is their lobbying organization) which try to restrict our use of advanced technology on their networks, yet it is a forum for all that advanced technology. Microsoft will supposedly announce Windows Mobile 6.1, but who knows when we will see it since the carriers control release. This is where the Apple iPhone distribution model shines, when they provide a release date, all users can expect to see it on that date (can't wait until June...). We will have to watch out for any other announcements. I am in a beta TypePad program to help enhance blog rendering and will be making what looks to be some minor tweaks to this blog. I use advanced templates which means I have to manually insert the new functions provided by TypePad. TypePad is working on mobile device rendering which won't come a day too soon in my book. My trapster.com review should be published on pocketnow.com this week.